The Marine Biology and Ecology academic program focuses on a wide range of field, laboratory, and theoretical coursework in a range of research areas, such as coral reef studies, biological oceanography and marine biology, fisheries biology, and the biology and behavior of marine animals. MBE faculty, students, and their many international collaborators participate in multi-institutional, multi-disciplinary research programs. 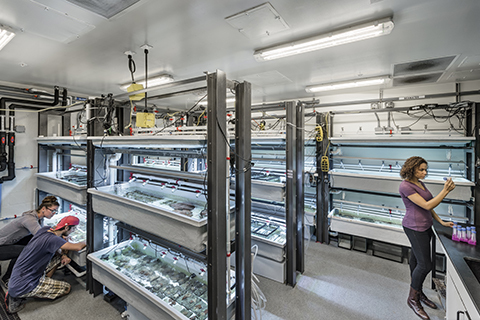 The UM Rosenstiel School hosts many research centers and groups, such as the experimental hatchery, The National Center for Coral Reef Research, the Rescue-a-Reef citizen science initiative, and the world-renowned NIH/University of Miami National Resource for Aplysia. Graduate students can choose from a diversity of research areas and coursework taught by internationally recognized scientists studying corals and climate change, fisheries biology, and conducting biomedical research. Master of Professional Science (M.P.S.) with tracks in Marine Mammal Science and Tropical Marine Ecosystem Management. Most successful applicants have a bachelor’s degree in biological sciences including a strong foundation in physical sciences (chemistry, physics, calculus) and basic biological sciences. However, applicants with a diversity of other degrees also are successful. Applicants should contact specific faculty to discuss mutual research interests. Applicants must take the GRE, and those whose first language is not English must pass the Test of English as a Foreign Language (TOEFL) with a score of at least 550. The advanced biology GRE is not required. Courses in marine biology and oceanography are not necessary for entrance into the program and are not recommended if taken in place of basic biology courses. The majority of Ph.D. students are supported as Graduate Research Assistants during their tenure (typically 5 years). You can find more information on stipends, tuition, and health insurance here. Students are also encouraged to apply for national fellowships. Additionally, students can apply or be nominated for University of Miami and Rosenstiel School fellowships and awards.